A strong week helped boost what was a torrid one before. However, it hasn't changed the larger picture of the decline from May's highs. The daily's continue to honor resistance (favouring shorts), with weeklies confirming this bearishness. But... breadth for the S&P has fallen enough to offer a long side play, although S&P Bullish Percents are still too rich for a major swing low. 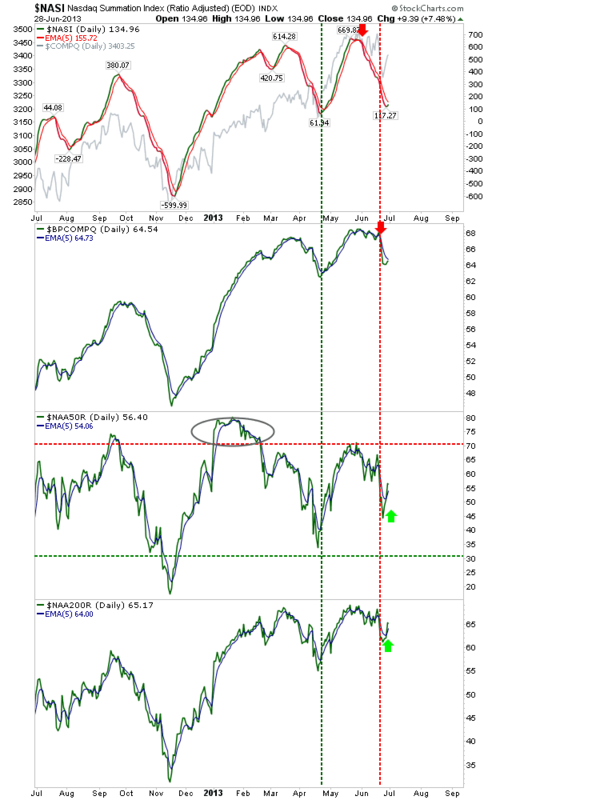 Nasdaq breadth metrics are attempting a swing low, but the Summation Index is suggesting "not yet". 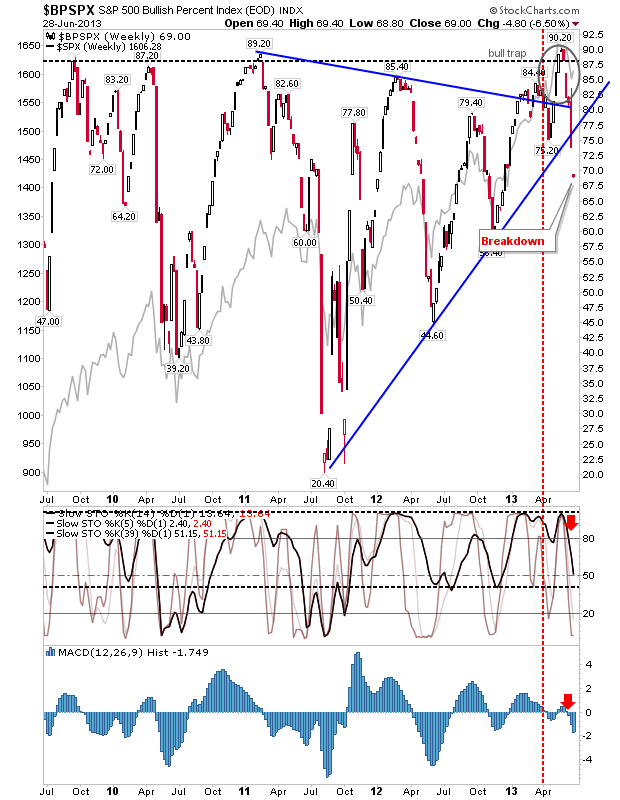 Again, the latter is not in negative territory associated with a strong swing low. 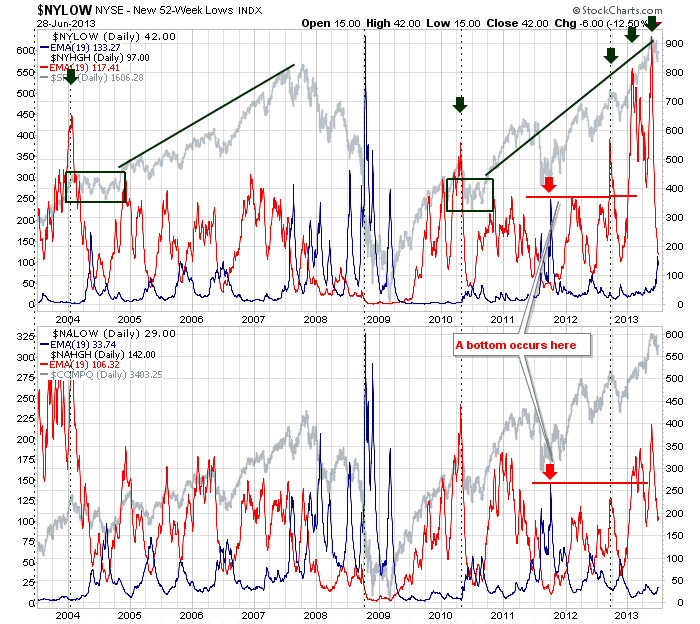 The New Highs / New Lows confirms the peak in a fashion similar to that of 2004 and 2010: trading range to follow? Crash watchers will want to see New Lows outscore New Highs for both NYSE and Nasdaq, but this is a long way from happening in the Nasdaq. 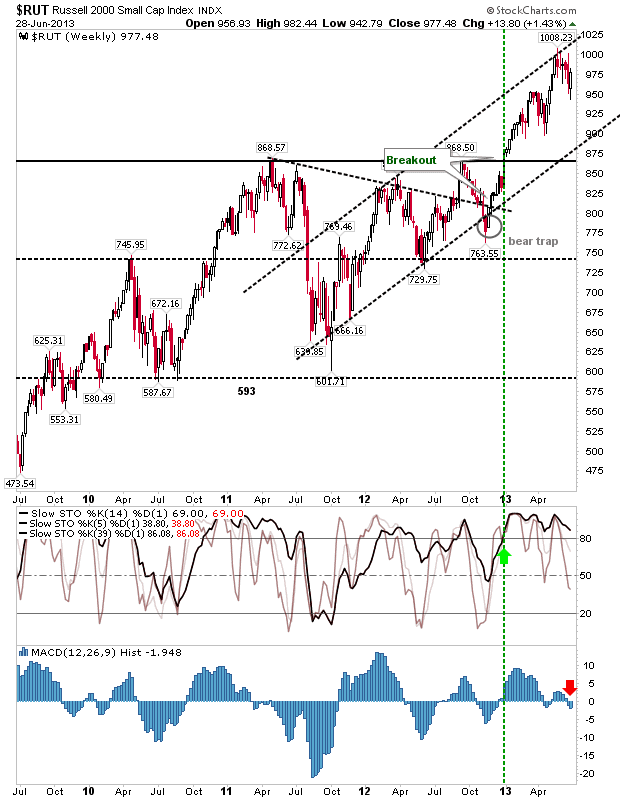 The Russell 2000 enjoyed a mid channel rally but with the MACD in 'sell' territory. 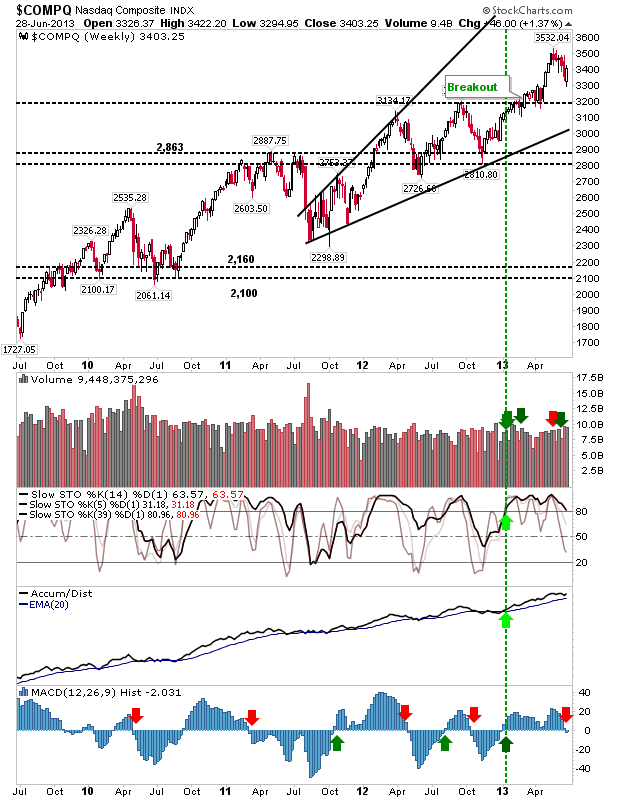 The rally left with it a bullish piercing pattern that should offer upside for the coming week (risk:reward determined by loss of 950). The Dow is doing its bit, although headline watchers will have been disappointed with the close below 15,000. 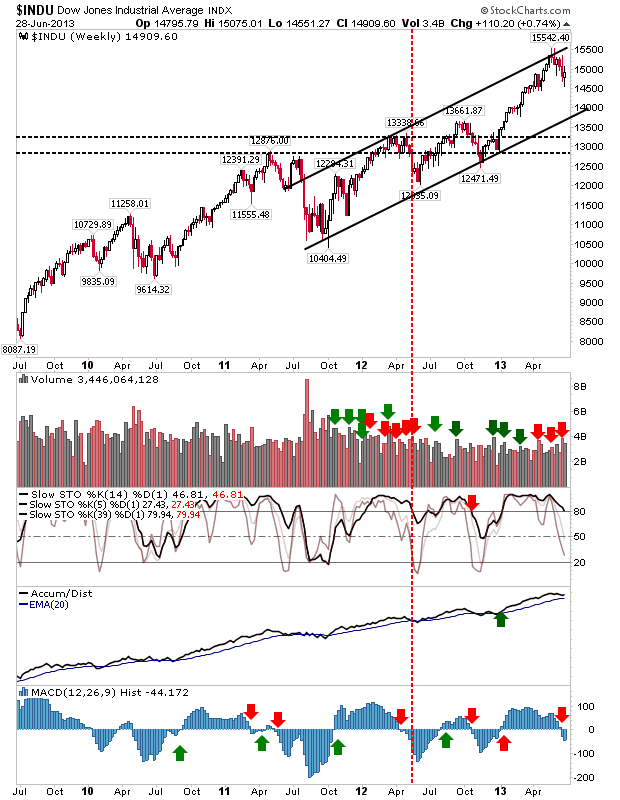 Trading in the upper part of its channel with what should be good support around 14,000. 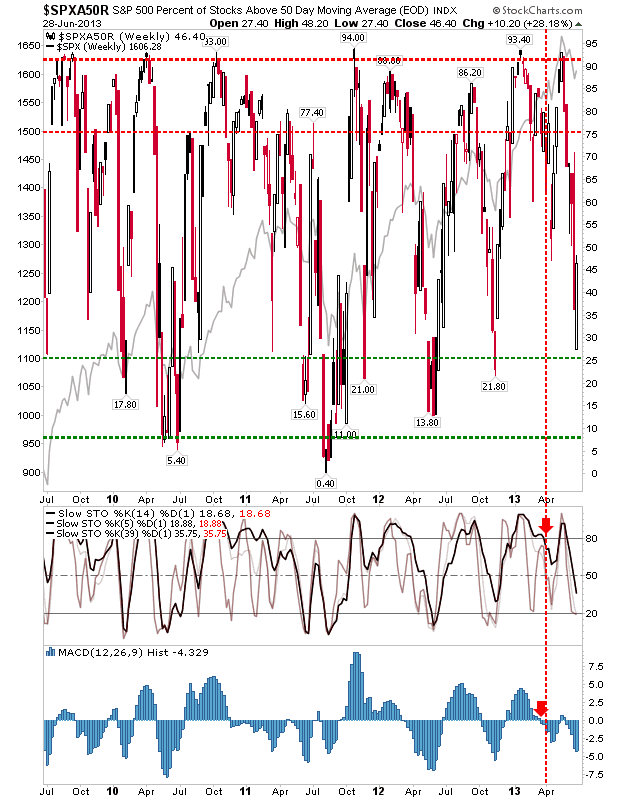 However, it looks to be the least attractive of the indices to trade for next week. 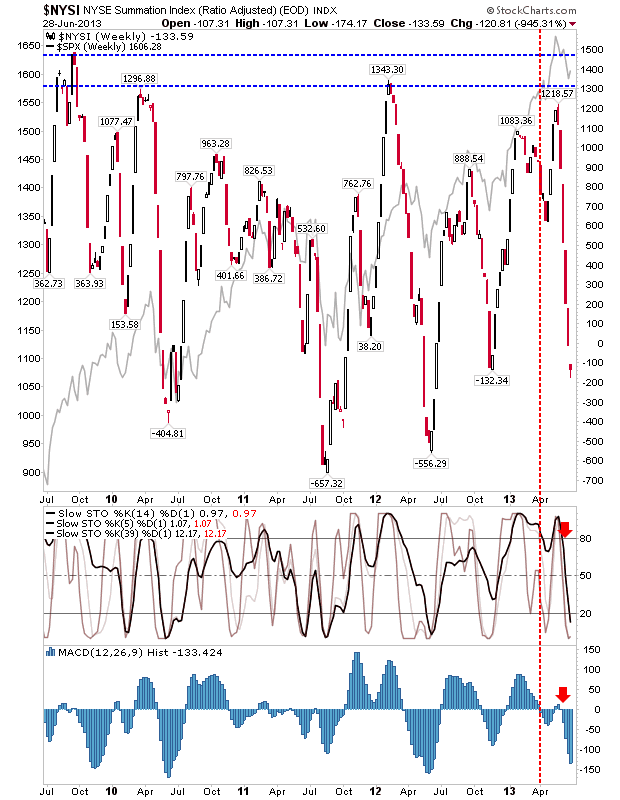 The Nasdaq also has a 'sel' in the MACD histogram to work off. Key support remains at 3,200. Decent bullish piercing pattern which should deliver more upside this week. The NYSE Summation Index has fallen enough, and is supporting a reversal candlestick, to suggest a tradable swing low is in play for the S&P. The Percentage of S&P Stocks above the 50-day MA is also suggesting the S&P has reached a tradeable swing low. But the S&P Bullish Percents are in neutral territory, but this may offer a repeat scenario to early 2010 when from a similar position an 8 week rally developed. It would appear that last week marked a trading range swing low, what's next is determining where the upper part of this range will form. 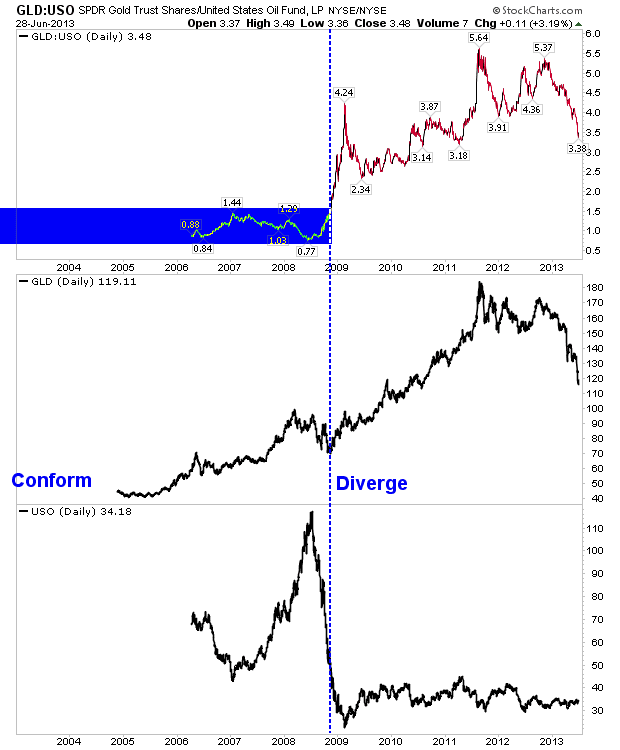 What hasn't happened is a major swing low, more suited to buy-and-hold investing, which needs a more substantial sell off than what we have had so far. Interesting sidebar chart: If gold was to fall to a comparable level traded by oil, then gold is looking at $700-800/oz.